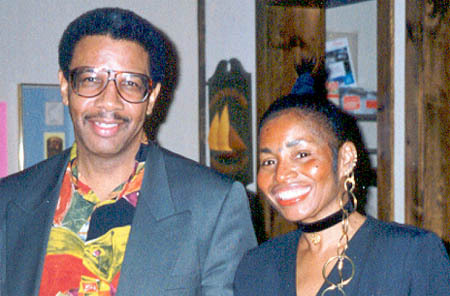 Charles Covington with his "helpmate" Becky Covington in 2006. Oftentimes one can look at a successful person and believe that their success is due to sheer initiative and self-determination. While there is some truth to this, a supporting cast is often needed to invoke confidence, motivation and moral support. Charles Covington has lived a life of purpose and has, to his credit, countless accolades in music, magic, checkers, martial arts, weightlifting and of course chess. He will tell anyone within earshot that much of his motivation came from his wife, help-mate and life partner… Becky Covington. In chess circles, one often hear of "chess wife stories" which could mean that either she hates chess or complains that he spends too much time playing. One famous story was that a disgruntled wife demanded that her husband (a famous U.S. master) choose between her or chess. He chose chess, divorced the wife and is happily remarried. Rarely will one see a chess wife at a tournament, but when it happens, it is almost a fantastic spectacle. Viswanathan Anand has become just as famous for having a beautiful wife (Aruna) at his side as he has for his sizzling play. "I remember several times I would come home from work and she would have chess players waiting to play me. She would fix lunch and dinner for them. She would enroll me into chess tournaments without me even knowing it." Becky and Charles in a playful moment during a chess match. I would like to thank my wife Becky for her time and patience in helping me to be a good chess player. We have been married for 41 years and Becky is my biggest fan. She bought chess books for me so that I could study to become a better player. I remember several times I would come home from work and she would have chess players waiting to play me. She would fix lunch and dinner for them. She would enroll me into chess tournaments without me even knowing it. I remember there was a chess exhibition coming to Maryland and she encouraged me to enroll in it to better my game. My wife bought most of my chess sets' clocks, and I also still have the chess books, to this day, that she has bought me over the years. I am still thanking my wife for the countless hours and time I spent away from our family concerning chess tournaments, and she never complained. My wife is the cause of my success in chess. Becky is an asset to me and I am still thanking her to this day. "She always came to his tournaments in Maryland. Many of the players looked forward to seeing her. She brightened up a lot of otherwise boring tournaments. Also the fact she was able to help Charlie while having her own successful career as an actress, model and business manager is even more impressive." "Being with him has been a wonderful life. I can't name a day this man hasn't called and said: 'I love and thank you for sticking by me.'" Charles Covington is perhaps known more for being a top jazz pianist than for being a master chess player and spell-binding magician. Over the years, Becky handled his concert bookings, interviews and other arrangements while balancing motherhood with a budding career in modeling and acting. Charles was once honored by Expo, a New York-based magazine. His wife gushed praise by saying, "Being with him has been a wonderful life. I can't name a day this man hasn't called and said: 'I love and thank you for sticking by me." While chess is a game of war, it can often produce a peaceful existence… especially when the spouse realizes that it is a positive, family-oriented and yes… peaceful activity. Chess would certainly be better off if there was but a few more helpmates like Becky Covington.